Chiropractors regularly treat sciatica and have terrific results. Sciatica is the Latin word for “Pain down the back of the leg” Sciatica is referred pain usually caused by trapping the sciatic nerve in the lower back. See back pain. The sciatic nerve runs from the lower back down through the buttocks and along the back of each leg. Sciatica is pain along this nerve and is a relatively common form of back pain and is usually caused by pressure on the sciatic nerve from a herniated or bulging disc. 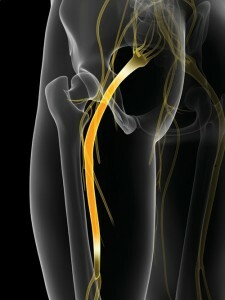 The pain from sciatica can be anything from infrequent and irritating to severe and debilitating. Usually, it affects only one side, the pain radiating through the buttock and down the leg and is often associated with a constant pain on one side of the buttocks, pain in the leg and/or buttock that may be worse when sitting , burning or tingling down the leg, weakness, numbness or difficulty moving the leg or foot or a shooting pain that makes it difficult to stand up. While sciatica can be extremely painful and uncomfortable, it is rare that permanent nerve damage (tissue damage) results. Most pain is due to inflammation and will improve within a period of time. Nerve pain is caused by a combination of pressure and inflammation on the nerve root, and treatment is centred on relieving both of these conditions. Typically, sciatica is made worse by bending, lifting, sneezing and coughing. Sciatica is a common problem for manual workers, sedentary office workers and is particularly prevalent during pregnancy. The sciatic nerve is the main nerve in the leg and the largest in the body. It runs from the base of the spine, along the back of the thigh to the knee, where it divides into branches. Sciatic pain is usually caused by compression of this nerve root at the point where it leaves the spine. Damage to the nerve can also cause pain. In young and early middle-aged adults, the most common cause of sciatica is a prolapsed intervertebral disc in the lumbosacral area of the lower back. In older people, changes in the spine due to conditions such as osteoarthritis may be responsible either by causing localised pressure on the nerve or by narrowing of the spinal canal – called spinal stenosis. Other bone disease or local injury may also be responsible. Sometimes, just sitting awkwardly can cause sciatica. Since there are many disorders that can cause sciatica, your Chiropractors’ first task is to determine the exact cause of your sciatic nerve interference. Spinal, orthopaedic and neurological examination. Posture pro scan may also be required to accurately diagnose your sciatica. As sciatica is due to pressure on the sciatic nerve, it stands to reason that treatment involves removing this pressure. Your Chiropractic treatment aims to achieve this by reducing nerve pressure caused by poorly moving spinal joints as well as easing muscular tension in the lower spine, buttock and leg. In addition to this, you will be given a series of home stretching exercises and asked to apply ice and heat to help aid your recovery. If you are suffering with sciatica at the moment please do not delay – you can achieve the best results when you address the symptoms early! For further information, or to consult with one of our skilled Chiropractors you can use the Contact Us or Appointment Request buttons at the top or bottom of this page, call our North Curl Curl practice on (02) 9939 8817, or visit Impulse Chiropractic & Natural Therapies‘s state of the art Chiropractic clinic at 15/64 Pitt Road in North Curl Curl. Medical Websites by Ideal Practice. © 2015, All rights reserved.